Being blonde I feel I am able to get away with constantly wearing black (maybe the fact I used to be the ultimate emo might have something to do with it). And really I'm just adding to how rubbish the weather is at the moment, but revealing my stomach a bit I seem to be trying to force myself in to believing summer will come soon! 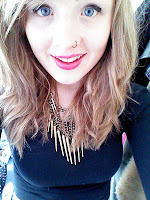 I recently picked this lipstick up from boots (17 surpreme shine lipstick - deep secret). I have been looking for a dark lipstick for ages but MAC lipstick isn't my favourite!! I absolutely love this lipstick and at the moment its definitely my go to lipstick!! Also makes my teeth looks loads whiter. Result!!! I also recently picked up this necklace from primark, I absolutely adore statement necklaces, they can change a whole outfit, which is great when you really can't find anything interesting to wear. I love the spikes, but I'm not too keen on the chain part, maybe this is a bit too statement for me!! 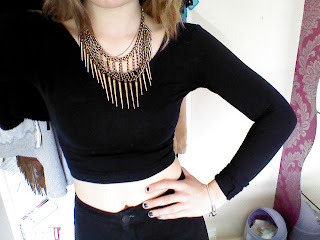 My top is from American Apparel, its just a basic black long sleeve cropped top. This is an xs I think, and it is so figure hugging in the right places! I love the long sleeves because it means it can be worn when its not that warm because there isn't much flesh showing, and can be easily dressed down or up!! These are the Topshop Joni jeans! As soon as I first saw them I had to buy them, regardless of how skint i was!! 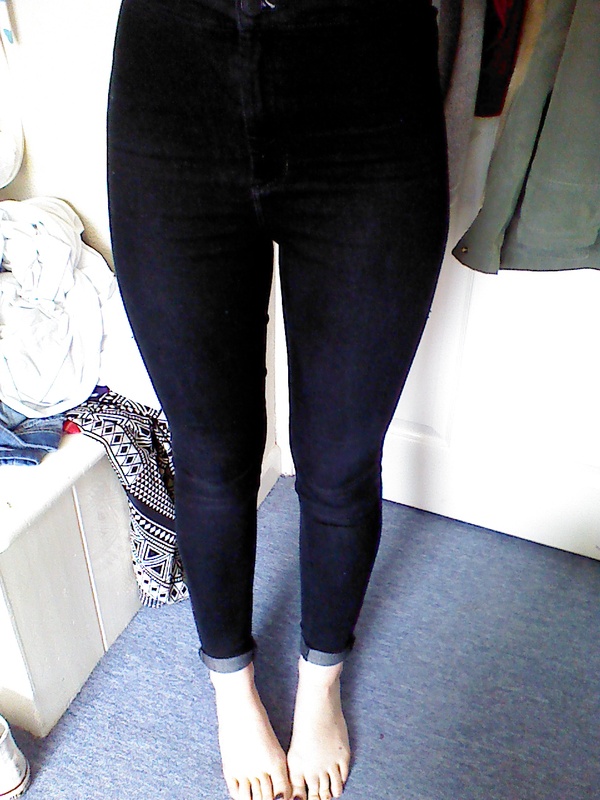 I absolutely love how tight and high waisted they are! I am a huge fan of high waisted clothing, (with huge hips/bum and a tiny waist its definitely the right look for me). They are so comfy! The only downside is the white stitching shows on the side, apart from that I cannot fault them!